Capacity 7 x 2ml / 0.07 fl. oz. 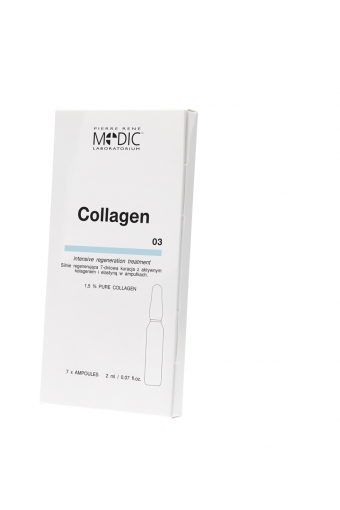 Intensively regenerating 7-day treatment with active collagen and elastin in ampoules A professional preparation with strong regenerative effects with a high content of natural collagen (from salmon) and elastin aimed at stopping the ageing process, intensive nourishment and soothing the skin. Already after 25 years of age, the skin gradually reduces collagen and elastin production, which results in wrinkle formation and loose skin. The use of collagen-containing preparations makes it possible to stop or slow the ageing process. Natural collagen contained in PIERRE RENE MEDIC ampoules is an active protein which penetrates deep into the skin, nourishes it, improves its firmness and stimulates fibroblasts to synthesise collagen. The addition of elastin, which occurs together with collagen in the human body, increases the firmness and elasticity of the skin. Regular use of the preparation makes the skin more firm, accelerates collagen synthesis, intensively moisturises the epidermis and considerably delays the formation of new wrinkles. INDICATIONS: The preparation is particularly intended for mature skin with signs of ageing, dry and dehydrated skin which requires regeneration, modelling and contour lifting, and improvement in firmness and elasticity. 100% peptides elixir PIERRE RENE MEDIC, intended for immediate smoothing out of deeper wrinkles, is an excellent complement to the treatment. How to use: Open by breaking the thinnest part of the ampoule. After cleansing the skin, rub the preparation between your palms and apply over your face, neck and cleavage with your fingertips. The skin may feel taut after use; this can be easily eliminated by using cream from the same series, but not earlier than after approx. 5 minutes from the application of the ampoule.